Boston Tea Party Re-Enacted to Celebrate MA Tax Repeal: But Will Retailers See a Difference in 2011? Thanks to a tip from Jon Chesto I learned that a group of wine retailers and enthusiasts gathered yesterday on the Boston side of the Fort Point Channel yesterday to re-enact the Boston Tea Party. But instead of tossing tea into the harbor they poured water from empty wine bottles to commemorate the alcohol tax repeal Massachusetts voters passed as part of Question 1 back in November. Starting January 1st, 2011, alcohol will be exempt from sales tax as it was from prohibition to 2008. There was also a group present showing their support for maintaining the tax as it was said to fund a variety of behavioral health services. I won't rehash that argument here. I'd rather focus today on how what impact this change will have on wine consumers in 2011. They're surprised the tax was repealed. They're glad the tax was repealed. They saw a huge boost in sales during the 2010 Massachusetts tax free weekend. They're cautiously optimistic about whether the tax repeal will have a sustained positive effect on their business in 2011. People sometimes find it hard to believe that others were making purchase decisions based on the tax. And in most low-dollar transactions I'd agree that was the case. But I think there's two scenarios where the sales tax does have an impact on purchase decisions, and they're both situations where the dollar volume is large and therefore worth paying attention to. The first is where you're buying a large quantity of wine for an event like a wedding. Say you're buying 8 cases of $15/bottle wine for a wedding. The 6.25% tax previous in effect amounted to $90. That's significant, and would be enough to make it worth your while to take a trip up to tax-free New Hampshire. Never mind for a moment that it's illegal to import alcohol into Massachusetts -and- illegal to carry more than 15 bottles of wine in your car without a special permit - more on that here. The second is more relevant to your typical Massachusetts wine enthusiast and that's in terms of a series of high dollar purchases. When you spend several thousands of dollars on a wine a year, it pays to think about the fully loaded cost of wine. When I say full loaded I mean thinking about quantity discounts, shipping, and tax. When the sales tax first went into place in 2008, it diminished the positive effect of case discounts. If you only got 10% off a straight case, most of that discount came right back as the 6.25% sales tax was applied. With the sales tax gone the effect of a case discount will be more compelling psychologically because I know when I see a $29.99 sticker on a bottle I'm eyeing I'd be able to knock that down to $23.99 out the door with a 20% discount. I like that. Massachusetts will become the only state in the union that taxes goods in general but excludes wine from sales tax. Prior to the tax going into effect, I don't think as many people realized how unique the situation was. I know I didn't. When I was out in California it always seemed like prices were really low. And they were, but the roughly 9% sure ate into the savings. I think retailers can really work this to their advantage now, especially when it comes to more expensive wines. At the higher end, consumers tend to do more price shopping - especially online - because shipping costs can be absorbed if the savings are high enough. Wine retailers can't legally ship wine to Masschusetts but that doesn't mean they can't ship wine to neighboring states. Consumers know this, and they also know that most retailers don't charge sales tax when shipping to most neighboring states. Just like with Amazon.com shopping online can be a beautiful thing in that respect. It's a gray legal area but when you're buying wine that costs $50 plus dollars a bottle it can make a big difference especially combined with being able to search nationwide for the best prices. But we've got some excellent wine retailers in the Boston area. Combine that with a legal tax-free advantage and free in-store pickup. Add to that the ability to try wines before you buy, establish relationships with knowledge retailers (especially at higher price points), and the ability to easily return corked bottles and the incentive to patronize local retailers is as strong as it's ever been. Shipping restrictions continue to limit consumer access to limited production wines (more on that in this brief history of MA wine shipping laws) but for wines that do make it into the state the question becomes whether retailers will be able to put wine on the shelves at compelling prices? Their prices are dictated by distributors - will they enable MA retailers to compete favorable when compared nationally? We shall see, but I'm more optimistic than I've been in a long time about buying wine in Massachusetts. Pro Tip for New Year's Eve consumption: Drink 1 full glass of water for every 5 ounce glass of wine you consume to avoid a hangover. Hope you have a safe night and here's to a great 2011 for you and yours. Cheers! About a month ago Wine.com did a $30 for $60 deal with Living Social. They're now doing what appears to be the same deal with Groupon. I have to say, I wasn't thrilled with the way the Living Social deal was structured and I let Wine.com know about it on Twitter. First is that the $60 Groupon can't be applied towards shipping costs. To Massachusetts, it costs $12.95 to ship the first bottle so at minimum you end up spending $42.95 for $60 worth of wine. That effectively makes the deal $30 for a $17.95 discount which is a lot less compelling than $30 for $60. Second, the voucher isn't a gift card. It's a discount code. This is significant because Wine.com only allows you to enter one promotional code per order. So say for example Wine.com is running a 1 cent shipping on $99 promotion - you can't stack that promotional code with the Groupon offer so you end up having to choose one or the other and the fully loaded cost of the wine shipped to your house isn't a very good deal. Third, with the Living Social deal anyway, the promotional code didn't trigger until the total value of the products in your cart was $59 or more. This seems incorrect to me. Any product total of $60 or less should be free and any total over that should be reduced by $60. The way it was structured seemed to encourage overshoot. In total, the deal created a situation where it was impossible to achieve a 50% discount -and- you ended up being forced to spend more than the cost of the voucher. When I buy a Groupon for a restaurant I can always choose to spend slightly less than the value of the voucher so I don't end up spending more on the deal than the voucher cost me. But with this deal that isn't possible and that doesn't feel right to me. All of that said, I'm going to take advantage of this offer too. Why? Well, they had a good deal last week on their Steward-Ship program where you could get holiday gift baskets shipped for free if you bought into the Steward-Ship program for $25 (regularly $49). This program is similar to Amazon Prime (which I'm a huge fan of and almost anyone can try for free with Amazon Mom - check it out ) in that it gives you free shipping on any order for a year. But, a unique aspect of Steward-Ship is that it can be combined with other discount offers. So say for example Wine.com offers 15% off 12 bottles. You could then buy a bottle of 2008 Caymus for $50.99 shipped free. And coming January 1st, 2011 to Massachusetts there's no tax on wine. A bottle of Caymus shipped to your doorstep in Massachusetts for $50.99 fully loaded? That's a pretty good deal. Still, I'm not thrilled about having to read the fine print and fight so hard to get a good deal on wine. Click here to check out the deal on Groupon - ends Wednesday December 29th at 11:59 pm Pacific time. Bonus Reading: I wrote up some thoughts on a couple of interesting cashback/deal sites I recently discovered called Envaulted and Offermatic. Good stuff - check it out. Question of the Day: What do you think of group buying deals like this as they relate to wine? How would you like to see retailers structuring these deals? The Urban Grape in Chestnut Hill, MA is hosting a series of wine maker dinners in 2011. 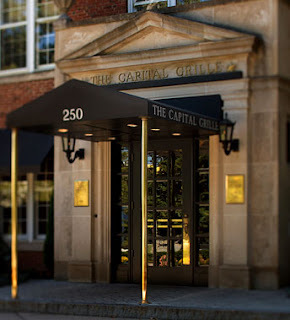 The first is Thursday, January 27th at The Capital Grille in Chestnut Hill featuring Augustus Huneeus from Quintessa. The evening includes a cocktail hour followed by a 4-course menu specially created the event and paired wines from Quintessa, Faust, Illumintation and Ritual. Cost is $125 per person. Click here for more information and to make a reservation. Of the wine aerators I haven't reviewed on this site yet, the one I'm most frequently asked about is the Nuance Wine Finer. It's a device that's inserted in the bottle, filters out cork and large sediment that might be in the bottle, aerates wine while it's being poured, and serves as a pourer. Sounds like an impressive collection of features. You may remember Boston-based CSN Stores who sponsored our Spectating on the Spectator contest - they sell everything from modern furniture to Wusthof knives. 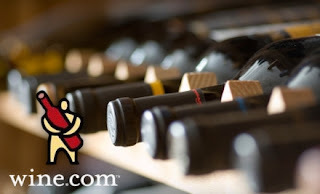 They sell the Nuance Wine Finer for $29.95 with free shipping. They've agreed to provide me with a sample unit so I'll be looking forward to checking it out and sharing my thoughts soon. Subscribe to the Wellesley Wine Press and you'll automatically be notified about new posts - I've got some year-end posts coming up I'm looking forward to sharing. Cheers! Pinot Noir plays well in so many seasons and occasions. I think of it as a harvest wine. It's a lighter red and doesn't have drying tannins so it plays well in the summer months. It's food-friendly -or- depending on the style works well as a cocktail wine. That pretty much covers 90% of the situations I drink wine in so it's not surprising it passed Cabernet Sauvignon as my most frequently consumed grape variety in 2010. One of the most interesting things I like to get out of comparative tastings of wines is a general understanding of the styles within that category. Sure, it's fun to sit down and compare a bunch of wines from the same category to see which you prefer. But one of the more fun and educational tastings you can do is a comparative tasting of the major wine regions American wine consumers consider when purchasing Pinot Noir: Oregon, California and Burgundy. The challenge is finding varietally correct examples of each at approachable price points. Over the past week I cracked open a trio of affordable Pinot Noirs that represent what I look for from each of these regions. I feel they're each delicious and enjoyable in their own right but if you sit down and compre these side-by-side I think they're even more interesting. Starts off with a lot of promise as the nose delivers beautiful cherry and earthy aromas you'd expect from an Oregon Pinot Noir. A nice dose of acidity and a long enjoyable finish. The only thing that's got me down is a green, stemmy aftertaste that lasts just a moment but is particularly distracting and off-putting. Oh, and it was a little thin too. But so close to being great! The green aftertaste seems to dissipate on the second day. Highly recommended. One of the best Pinot Noirs I've found in this price range the past year. So there you have it. 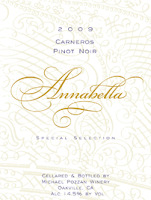 A nice trio of Pinot Noirs that can be had for $52.97. Enjoy! Why on earth didn't this wine make the 2010 Wine Spectator Top 100 list? I mean, people were projecting it to be the Wine of the Year. It didn't make the Top 10. It didn't even make the list! The only reason I can think of is that it was rated too late in the year to be considered in 2010 because the metrics are all there. The wine carries a high score from Wine Spectator (93 points), has wide availability (18,901 cases produced), comes from a hyped-up vintage in a popular category, and for those skeptics out there is produced by a prominent advertiser in the publication. How did it miss? The 2007 Ramey Claret and the 2007 BV Tapestry were both rated 93 points in the October 15, 2010 issue and neither made the Top 100 list. The 2007 Ramey Annum was rated in the August 31st issue and did make the Top 100 list so perhaps that explains it. Who knows? Maybe these are early candidates or speculation on the 2011 Top 100 list! 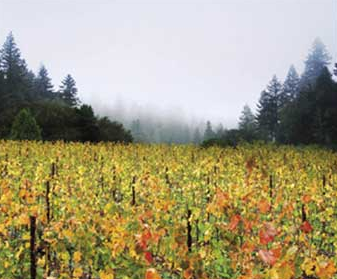 Diving into the number and looking a little more closely at the other 93WS 2007 Napa Cabs we see 30 wines ranging from $38 (07 Ramey Claret) to $300 (07 Hundred Acre Arc Vineyard) with an average release price of $126. Not only is this wine's release price very low price compared to its quality - it's readily available for around $30 if you shop around. I purchased mine at The Wine Cellar of Stoneham for $32.99. A little rough and tumble at this stage but I like it. Deftly ping pongs between sweet and savory. The nose goes more in the savory direction whereas the palate delivers the fruit. Ample acidity, then a long vanilla-laced finish. Multi-faceted. Well done and quite a value if you can find it just north of $30. Recommendation: Buy 3 bottles. Try one now and wait a year before opening the next. Update: I pinged Wine Spectator Executive Editor Tom Matthews on Twitter. He said that their December 31, 2010 issue was the cut-off for the 2010 Wine of the Year which makes sense but also confirms that both the Tapestry and the Ramey Claret were considered for the list but didn't make the cut. I think this creates a buying opportunity for these wines. If they landed on the Top 10 they surely would have been much harder to find. Have you had this wine? If so, what did you think? If not, what are some other 2007 Napa Cab value plays you've found in the $30 range? 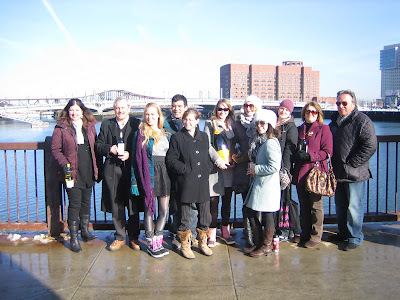 Looking for discount codes to the 2012 Boston Wine Expo? Groupon is offering Sunday tickets for $50 (regular price $85). You're probably busy thinking about everything you need to get done before Christmas, but I thought to mention the 20th Annual Boston Wine Expo coming to the Seaport World Trade Center January 22nd and 23rd, 2011. Perhaps you might want to give tickets as a gift? If you're a freelance wine writer -or- wine blogger with more than 10,000 unique page views a month you might qualify for media admission. Click here to check out the details - thanks to The Passionate Foodie for the pointer. Another option: Braintree retailer Bin Ends Wine has some tickets they're offering for $77 valid for either Saturday -or- Sunday (but not both). More here. Interested in sampling wine that retails for $75 and up? Then this offer is for you. The Sunday Grand Cru Wine Lounge is the perfect way to spend an afternoon sampling fine wine and tasting delectable treats from the top restaurants in the city. Ticket includes admission to the Grand Tasting on the same day. The most popular event of the weekend, the Grand Tasting features hundreds of wines from around the world, chef demonstrations, restaurant sampling, wine clinics and much more. The Saturday Grand Tasting features everything happening on Sunday except on our most popular day! To buy tickets for the event, click on the "Buy Tickets" link on the Boston Wine Expo site. 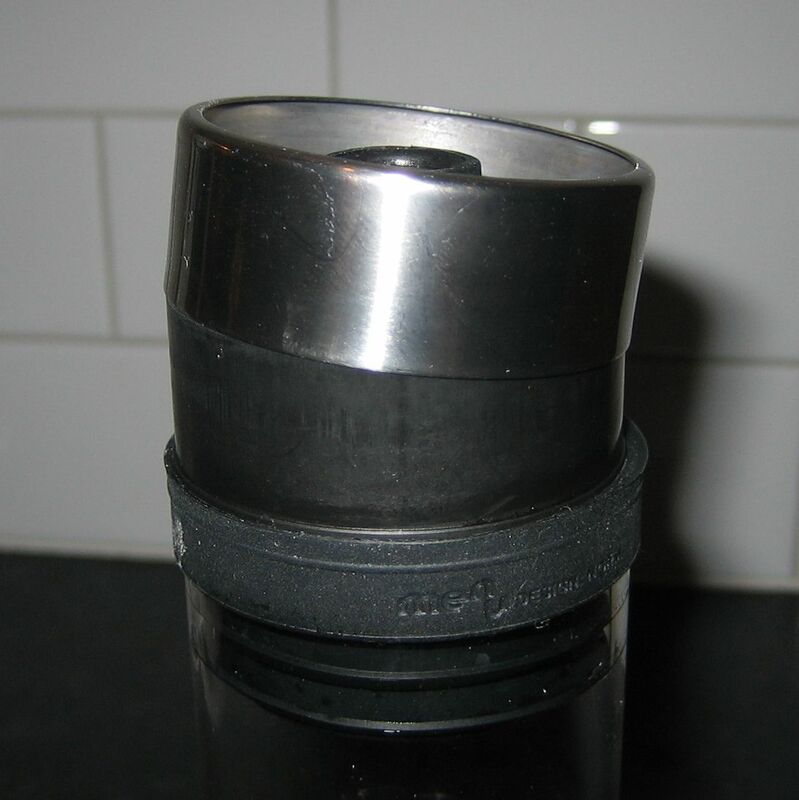 A few weeks ago I received a sample of a new type of wine decanting product - the Menu Wine Breather. 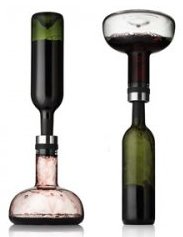 It's a hybrid sort of device that combines characteristics of single-serving active wine aerators (like the Vinturi and the Soiree) with characteristics of an old school passive wine decanter. The net result is a device that promises to aerate an entire bottle of wine in a couple of minutes. I used it for all the wines I served on Thanksgiving so while that experience is fresh in my head I thought to share my thoughts on it for you holiday shopping consideration. Once I rinsed the product off and put the top on I was ready to decant my first bottle of wine. From watching the video I understood how the device was intended to be used. The fact that it aerates an entire bottle all at once makes it a good match for holiday gatherings. On a weeknight when you're having just a glass or two you probably don't want to decant an entire bottle. But when you're serving a few bottles in succession to a group, the Wine Breather's ability to aerate an entire bottle in just a couple of minutes is very useful. A traditional decanter would be sitting there full of the first bottle of wine for an hour or more and subsequent bottles likely wouldn't have time for more than a splash decant (where you purposely pour the wine into the decanter such that it splashes on the bottom of the vessel and aerates the wine a bit in the process) and some aggressive swirling around in the vessel and each glass. It's a little nerve wracking at first when the bottle is mostly full and it's completely inverted on top of the Wine Breather. I kept a hand on it to make sure it didn't topple over. Guests and kids were quite fascinated by yet another wine contraption I've busted out over the years. Never discount theatrics as a means for getting people interested in a wine accessory. I like that I can pour the wine into the vessel and let it sit for a few hours if I have the time. Or, if I'm in a hurry I can quickly pour it back into the bottle (for a so-called "double decant"). I prefer pouring wine from the bottle it came in rather than from a decanter because people can see the label of the wine -and- decanters can be tricky to pour from (the last glass in a bottle especially). The Wine Breather reminds me a bit of the Soiree (review) because of the way wine cascades along the sides of the glass and exposes the wine to air in the process. I used the device on three bottles for Thanksgiving. For each, I tasted the wine directly from the bottle to get a feel for how much decanting it seemed to require and then based on that I'd more or less aggressively use the device. The first bottle was a 2005 Cakebread Benchland Select Cabernet Sauvignon. At 5 years old, it was quite open aromatically with soft tannins. It didn't need a great deal of decanting so I poured it into the Wine Breather, let it sit for an hour or so and then poured the wine back into the bottle and served it from there. Nice wine - good result. The next bottle was a young 2008 Sea Smoke Southing Pinot Noir. The wine was very limited aromatically and although it showed promise on the palate needed some serious encouragement to come out of its shell. I decided to double decant it with the Wine Breather and then taste it. It seemed to help a little but I thought it could still use more decanting so I did another pass through the device and then back into the bottle. A quadruple decant! The wine was still pretty bashful and tight aromatically but its flavors were more apparent on the palate and its finish was impressive. The third and final bottle was a 2006 Leonetti Merlot from Washington state. This wine presented a unique challenge in that it had silty sediment in the bottle. However, it was quite Bordeaux-like in style (graphite and tar on top of powerful fruit) so I thought it would be a good idea to run it through the Wine Breather. It ended up jostling the fine sediment quite a bit and each glass was quite murky. This particular style of wine would be better served by traditional decanting for the purpose of letting the sediment fall to the bottom of the device and gently pouring off wine from the top. Lesson learned, but this an objection many will raise about wine accessories that involved inverting the bottle for optimal effectiveness. I'm a firm believer in using blind tasting to assess the effectiveness of products like these. What I'm looking for when tasting is more pronounced aromatics (as opposed to being closed), rounder flavors (as opposed to being sharp), and a smoother finish. The first test I did was a head to head blind tasting of a glass of wine that was poured right out of the bottle vs. one that went through the Menu Wine Breather. For this test I used a 2007 Brancaia Toscana Tre - a well regarded quality-price-ratio favorite that seems to catch a lot of comments on CellarTracker that it needs air. I couldn't tell the difference between the glass passed through the Menu and the one that was not. Tie. I thought - hmm. I need to create a situation where there is a control sample (pop 'n pour) and a should-be-good sample (decanted a couple of hours in a traditional decanter) and then see how the Menu does compared to these other two. For this test I cracked open a bottle of 2006 Produttori Barbaresco - young for a Barabresco - and invited a friend over. I then poured the wine 3 ways for him and vice versa. Conclusion: For me, the Menu performed well in blind tasting overall. 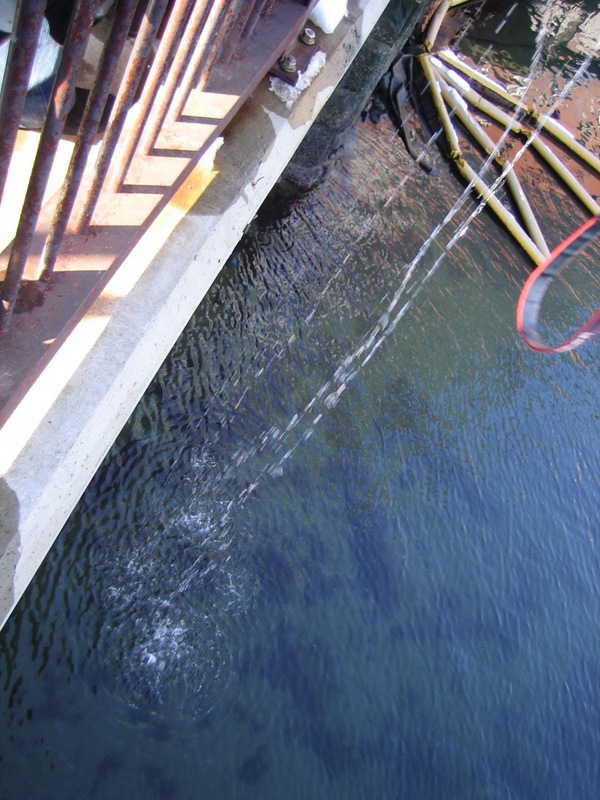 It performed as good or better than pop 'n pour in each test -and- it produced similar results to a 2-hour decant in 2 out of 3 tests. 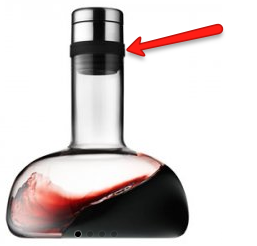 I like the way it can quickly aerate an entire bottle of wine, and if I feel like a wine could benefit from more air it's easy to run it through the device multiple times back and forth between the bottle and the Menu Wine Breather. Winner will be announced Friday morning. Good luck! Update: Tara is our winner! Congratulations - here are the details.